I was honoured to be asked to read from my book , Private Sully Goes to War, at an event commemorating our soldiers for Remembrance Day. 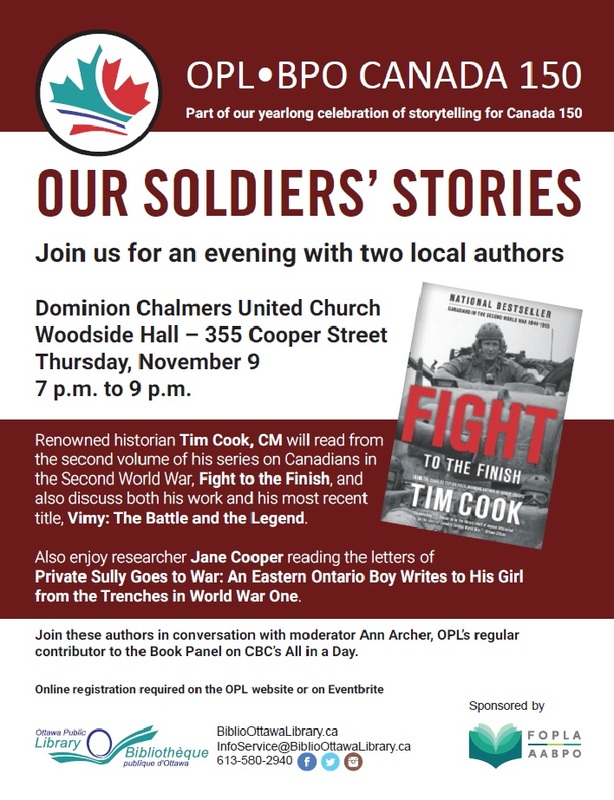 Excellent analysis from Tim Cook, author of The Necessary War and Fight to the Finish, about Canadian soldiers fighting in WWII. 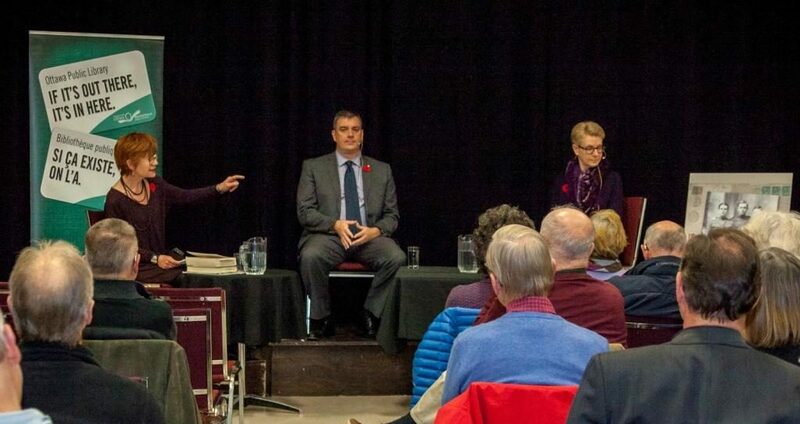 Big thanks to host Ann Archer, and the Ottawa Public Library, and to David White for giving voice to Elmo Sully. Join me for an Ottawa Public Library event, November 9, 2017, to talk about understanding war history through soldiers’ letters. October 6, 2017—Local singers to recapture a lost Canadian voice in concert. Announcing a concert to launch a new Canadian historical biography, The Canadian Nightingale: Bertha Crawford and the Dream of the Prima Donna, to be held January 21, 2018, 2:00 pm at the Church of St John the Evangelist, 154 Somerset Street West, Ottawa. Under the direction of Ottawa musicians, Cara Gilbertson-Boese and Joanne Moorcroft, the concert will bring together contemporary Canadian musicians to recapture the lost voice of Bertha Crawford (1886-1937). Ottawa soprano Ania Hejnar will draw on her personal connection with Crawford’s story. In June 1924, a 19-year-old Polish engineering student, Kazimierz Kozłowski, bought a standing-room-only ticket to see his first opera at the Great Theatre in Warsaw. Captivated by the performance of the Canadian soprano Bertha Crawford with Adam Didur, the Polish star of New York’s Metropolitan Opera, Kazimierz fell in love with opera. In 1961, Kazimierz’s daughter, Ewelina Kwasniewska, began a 23-year career as the lead soprano with the opera company of the Great Theatre in Lodz, Poland. In 1984, Ewelina moved to Kingston, Ontario and began teaching Canadian voice students. Building on what she learned as one of Ewelina’s students, Ottawa soprano Ania Hejnar will be one of the performers in this concert who will reimagine how Bertha Crawford sounded on the Polish stage. Other performers in the concert will include sopranos Leandra Dahm and Taryn Redmond, and the Harmonia Choir, directed by Kurt Ala-Kantti. Ambition. Fame. Betrayal. The Canadian Nightingale: Bertha Crawford and the Dream of the Prima Donna, reveals the untold story of a gifted young woman from small-town Ontario, who rose to unprecedented success on the opera stages of Russia and Poland, only to be forgotten for eighty years. Tracking a roller coaster ride to celebrity that was ultimately derailed by broken trust, this new Canadian biography revives a singular voice, and reminds us how important it is to recognize Canadian talent and artistic contribution. Inspired by a passing reference in a 1924 family letter, six years of research and writing have resulted in a full cradle-to-grave biography which reconstructs the overlooked life of possibly the most successful Canadian opera star in Europe in the first quarter of the 20th century. From a youthful start as the soprano soloist at Toronto’s Metropolitan Methodist Church, Bertha Crawford built a name for herself across Canada in the first decade of the last century. But she had to leave Canada to get the European training and experience she needed to be considered a really serious performer at home. Ironically, Crawford became such an established star in Poland that she lost touch with her Canadian audience, and was forgotten in the land of her birth. And yet, while she was a well-loved performer across Poland, the ‘Canadian Nightingale’ was never considered Polish in her adopted home, and so has been forgotten there too. Jane Cooper is a researcher and writer from the Ottawa area. 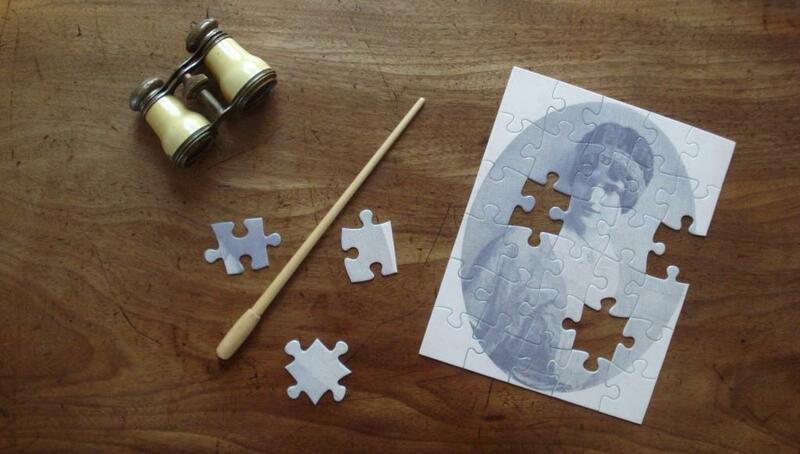 Undertaking policy research by day, by night she escapes into the history of the early 20th century. Working on and off in the former Soviet Union over the past fifteen years, she has developed a particular interest in the experiences of Western women in Eastern Europe in the early 1900s. July 23, 2017—A new Canadian historical biography will be released this fall, thanks to the commitment of 90 Canadians to invest over $5,000 in the publication. More than 100 copies of the book have been pre-sold, with new orders coming in daily. Rejected by traditional publishers as ‘too difficult to market’, The Canadian Nightingale was the subject of a Kickstarter crowdfunding campaign that leveraged social media to test the real interest of Canadian readers in the history of Canadian music and culture. From a youthful start as the soprano soloist at Toronto’s Metropolitan Methodist Church (now the United Church) on Queen Street, Bertha Crawford (1886-1937) built a name for herself across Canada, in the first decade of the last century. But she had to leave Canada to get the European training and experience she needed to be considered a really serious performer at home. Jane Cooper is a researcher and writer from the Ottawa area. Undertaking policy research by day, by night she escapes into the history of the early 20th century. Working on and off in the former Soviet Union over the past fifteen years, she has developed a particular interest in the experiences of Western women in Eastern Europe in the first quarter of the previous century. Forgotten Canadian Opera Star Brought Back to Life Through Crowdfunding. Rejected by traditional publishers as ‘too difficult to market’, The Canadian Nightingale is the subject of an upcoming Kickstarter crowdfunding campaign that will leverage social media to test the real interest of Canadian readers in the history of Canadian music and culture. “Mainstream Canadian publishers think classical music fans are a small niche market who are hard to reach, and not interested in Canadian history anyway. I think they are wrong. This crowdfunding campaign will allow readers to pre-order my book and ensure that this Canadian musician is restored to her place in history.” says author Jane Cooper. This historical biography will be published by FriesenPress in the fall of 2017. As of May 25, 2017, readers can visit the Kickstarter site and pre-order their copy of the book, and help get this story into homes, libraries and schools across Canada. Jane Cooper is a researcher and writer from the Ottawa area. Undertaking policy research by day, by night she escapes into the history of the early 20th century. Working on and off in the former Soviet Union over the past ten years, she has developed a particular interest in the experiences of Western women in Eastern Europe in the first quarter of the previous century. April 2016. PhD. 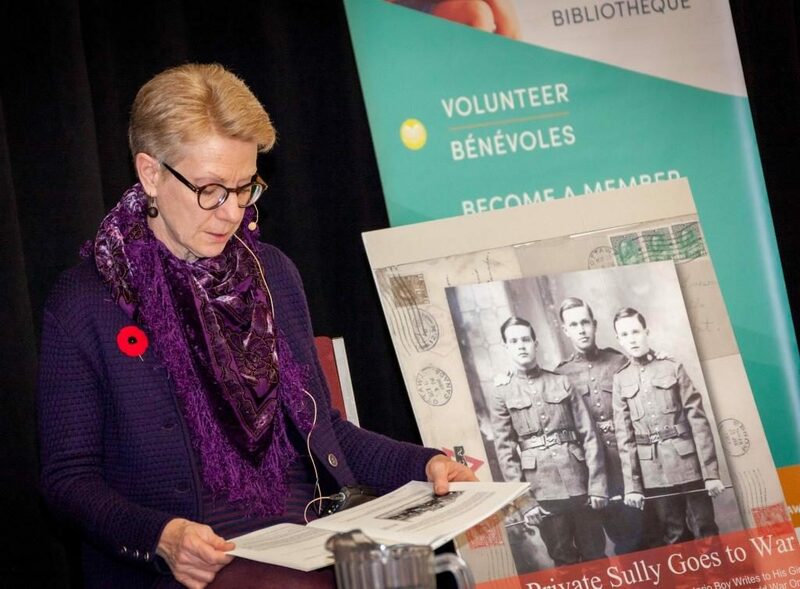 candidate, Dorothy J. Smith, will be using Private Sully Goes to War as one of her teaching resources during a six-week Learning-in-Retirement Course, “Putting a Face on the Great War”, at Ottawa’s Carleton University, April and May 2016. See her video description of the course on YouTube. April 2016. Jane Cooper will be speaking about Private Sully Goes to War, and the process of researching and writing about historical letters, at the Greenboro Branch of the Ottawa Public Library, April 23, 2016 at 2:00 pm. The companion web site for Private Sully Goes to War was profiled in the Ottawa South News, September 1914. January 2014. On a visit to the National Archives in London Jane found traces of Bertha Crawford’s trail in 1918 and 1919 correspondence of the Foreign Office. Canadians were looking for Bertha then, and the search continues today. Editing the full draft manuscript of The Canadian Nightingale continues this month. Read about the research behind The Canadian Nightingale in the November 2013 Issue of the Canadian Antique Phonograph Society (CAPS) Newsletter.